Out of stock since Sunday, 16 December 2018. Due back soon. Out of stock since Thursday, 13 December 2018. Due back soon. Iams ProActive Health Senior & Mature is a complete and balanced diet for older cats that supports their nutritional needs as they get to their later stage in life. As cats get older their need change so so should their diet. The Senior & Mature Diet from Iams is specifically formulated to support an older cat's needs and the recipe helps to promote 7 essentials of health vitality for them as they reach their later years. Dried Chicken And Turkey (39%, A Natural Source Of Taurine), Maize, Wheat, Animal Fat, Dried Beet Pulp (1.6%), Dried Whole Egg, Hydrolysed Animal Proteins, Fructooligosaccharides (0.69%), Brewer'S Dried Yeast, Potassium Chloride, Fish Oil, Calcium Carbonate, Sodium Chloride, Glucosamine. Vitamin A (97690 Iu/Kg), Vitamin D (13111 Iu/Kg), Vitamin E (282 Mg/Kg), L-Carnitine (51Mg/Kg), Trace Elements Contain Cupric Sulphate Pentahydrate (38 Mg/Kg), Zinc Oxide (228 Mg/Kg), Manganous Sulphate Monohydrate (138 Mg/Kg), Potassium Iodide (1.6 Mg/Kg), Basic Cobaltous Carbonate Monhydrate (5.2 Mg/Kg). 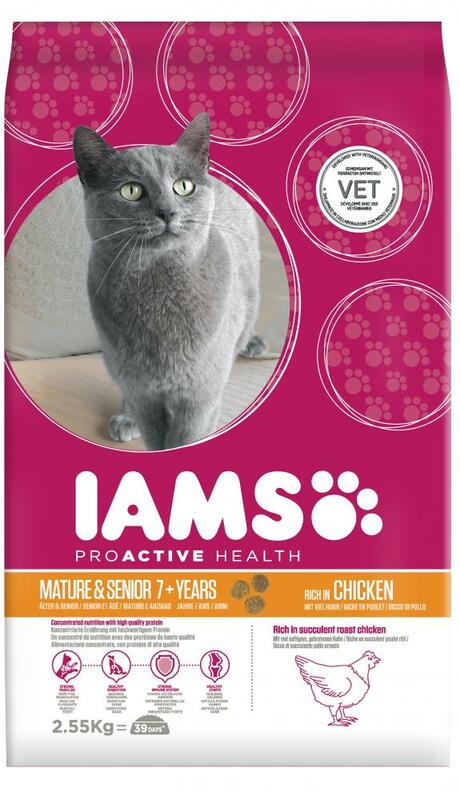 There are currently no questions for Iams Proactive Health Mature & Senior Chicken Cat Food - be the first to ask one!